First things first – GNSS is the new GPS. Actually, GPS is a subset of GNSS. GPS stands for Global Positioning System, GNSS stands for Global Navigational Satellite System. For decades folks refereed to any and all satellite navigation systems as GPS, and for good reason – the US Global Positioning Satellite system was the only game in town. However, the term ‘GPS’ properly describes just the global positioning system established and maintained by the United States. Now that the Russian GLONASS system is operational, and systems from the European Union, China and perhaps other players (India?) are coming on-line, the term for ALL space-based satellite navigation systems has shifted to GNSS. I spent the last two days in training finally learning how to run Trimble’s TerraSync and Pathfinder Office software. We’ve had TerraSync and Pathfinder Office software in our office for years, but never got any formal training on how to use either package. The training was actually very good, and I can see now why a lot of surveying and engineering firms prefer TerraSync over GIS-centric packages like ESRI’s ArcPad. The class was taught by one of the training and support personnel from our local vendor, NEI, and he did a great job. Woven throughout the class are discussions about GPS, datums, coordinate systems and issues like unanticipated coordinate system shifts due to improper datum selection or datum mis-matches between the software and virtual reference station (VRS) datums. We spent a good deal of time in the field actually experiencing the impact of changing datum selections in the software (for example, the shift seen when selecting NAD83 vs. NAD83 HARN). In the olden days, like before the turn of the century, these datum shifts generally didn’t concern GIS folks. The shifts introduced by any datum mis-match were well within most folk’s error budgets. In most cases we were ecstatic when GPS got us within a few dozen feet of the features we were collecting. When the accuracy standard of the 1:50,000 topographic map you were using as a base was +/- 50 meters having GPS points a dozen or so feet off was no big deal. In fact, we were tickled pink to be able to get that level of autonomous GPS accuracy. Today things are much different. Improved GNSS software, antenna designs, the open availability of reliable GPS and GLONASS signals and the wide availability of GPS augmentation services like WAAS and local virtual reference stations (VRS) means that these systems are capable of sub-meter, often sub-foot, accuracies. That’s just for GIS data collection. Survey-grade GNSS systems are capable of real-time accuracies to tenths of a foot. Suddenly datum shift errors of even one foot become very, very important for high precision data collection and surveying. One of the biggest problems people in my line of work face is a general lack of understanding of GNSS in the GIS and civil engineering fields. In particular, many professionals lack up-to-date training and working knowledge of GNSS system capabilities, limitations and application to their line of work. Evaluating and planning for the potential impact of things like datum shift on GNSS-based surveys or data collection projects is something they can’t comprehend largely because they haven’t been trained on it and, perhaps most important, have’t been forced to consider it when planning or managing a project. Sadly, I’ve met far too many people with a GISP certificate hanging on their wall who couldn’t tell me the fundamental difference between the NAD 27 and NAD 83 datums, and I have yet to meet a single civil engineer who is not also a licensed surveyor who could explain to me the importance of knowing the datum his or her CAD drawing coordinate system is based on. Yet both of these groups – the GIS professional and the civil engineer – have a fundamental interest in controlling the overall accuracy and precision of their work. For the GIS professional it’s a matter reputation and trust. For the licensed civil engineer it could be a matter of putting his or her work at legal risk. If you work in the GIS field you can not call yourself a GIS professional unless you have a fundamental understanding of datums, coordinate systems and the importance of applying this knowledge to your workflows. A strong knowledge of datums and coordinate systems is one of the foundational building blocks of our profession, and since so much of what we do these days is GNSS-based it makes it equally important to have a strong understanding of the impact different datum selections can have on the spatial quality of our data. I’ve said before in this blog that those GIS ‘professionals’ who consider GIS to be little more than making web maps are headed to extinction. Here in the Atlanta metro area it would take me about an hour to hire a busload of web developers who can make web maps (and this includes time out for a stop at Starbucks). If that bus accidentally rolls into the Chattahoochee River and everybody drowns I can get another busload just as fast. However, the number of GIS professionals I’ve run into who can tell me the anticipated shift in State Plane (NAD83) and State Plane (NAD83 HARN) coordinates wouldn’t fill the first row of that bus. For the civil engineering community the issue is less obvious but just as critical. GNSS-based surveying and data collection is becoming the norm on many projects. It is faster, cheaper and just as accurate as conventional surveys under the right conditions. This means civil engineers will be incorporating more and more GNSS-based data into their designs and relying on GNSS for jobsite control, machine control and as-built data verification. While the task of establishing project control, setting up survey equipment configurations and managing project survey requirements will fall to the the project surveyor, the project engineer still has overall responsibility for ensuring things are built to design. If the project stakeout is a few feet out from the design drawings it may not be because the instrument operator has a hangover; it may be because the design work was done in one datum and the GNSS survey unit is set to another. Being able to identify a potential datum shift problem is a key skill for civil engineers working in today’s GNSS-based world. I was going through some photos in my collection for some Facebook friends and ran across a collection of old shots I acquired while assigned to the 320th Engineer Company (Topographic) back in the late 1990s. I say ‘acquired’ because I just happened to find them lying around my office as part of some left over historical records from the old 649th Engineer Battalion (Topographic). 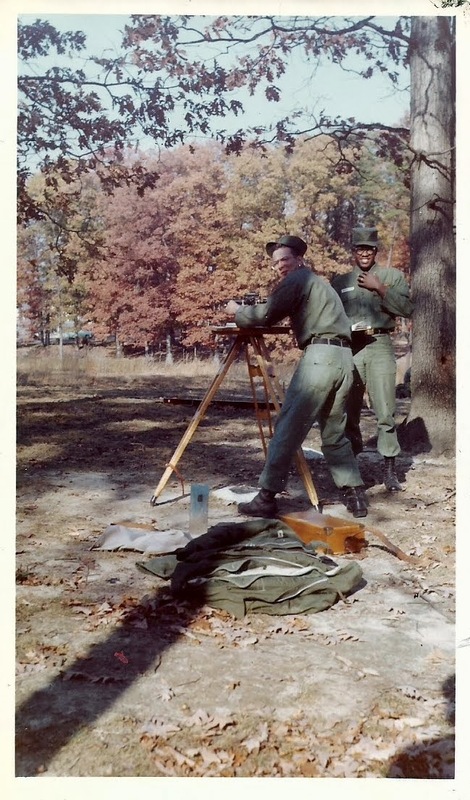 All are 1970’s vintage photos that highlight the map making activities of the 649th. The 649th provided comprehensive topographic support – survey, map production & distribution, terrain analysis, and geographic intelligence analysis – to US Army Europe (USAREUR). 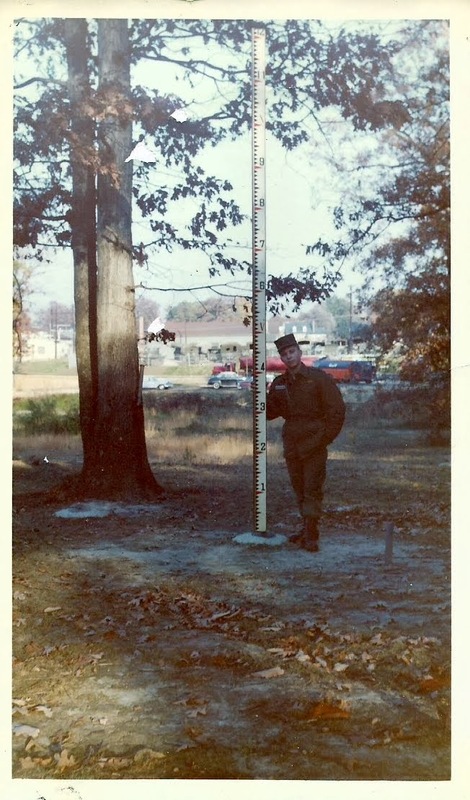 In the early 1980’s I was assigned to the 649th at Tompkins Barracks in Schwetizingen, Germany. I served as the commander of one of the terrain analysis detachments. I have a lot of good (and some not-so-good) memories of the 649th and the Soldiers that served in the unit. Fifteen years later I found myself back in Germany. By then the 649th had been deactivated and my unit, the 320th Engineer Company (Topographic), was the last surviving remnant of the 649th. The 320th had received a lot of left over equipment and paperwork from the 649th and one of my duties was to sort through it all to determine what was worth keeping and what could be trashed. During this process I found the photos you see in this post. All of these photos were rejects, shots the photo editor didn’t think were worthy of using in a presentation. That accounts for a lot of the grease pencil ‘mark outs’ you see on many of the images. 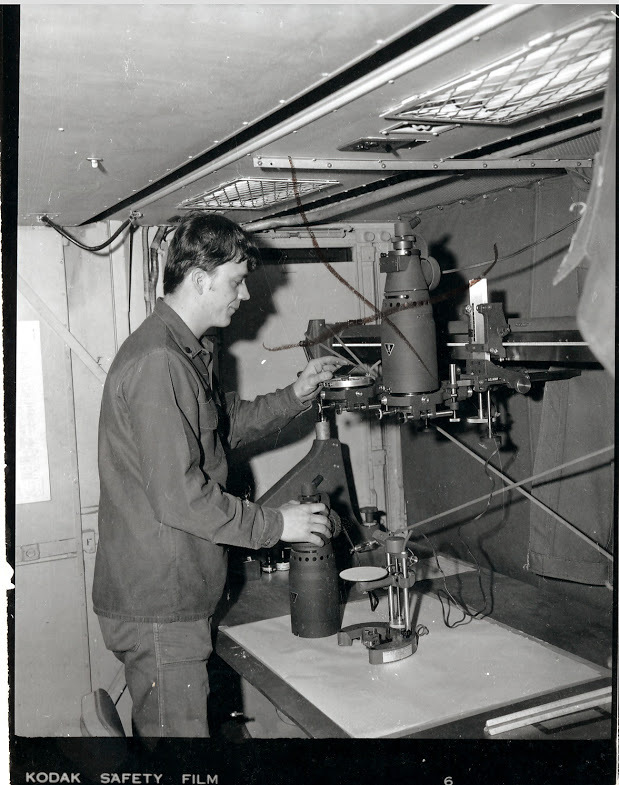 The interesting part is that the pictures that made it past the editor and into various publications or presentations are long gone – either packed up with the unit’s archives and locked away in an Army records warehouse or tossed into a trash can. Only the rejects survived to make it to my desk long after the battalion inactivated. 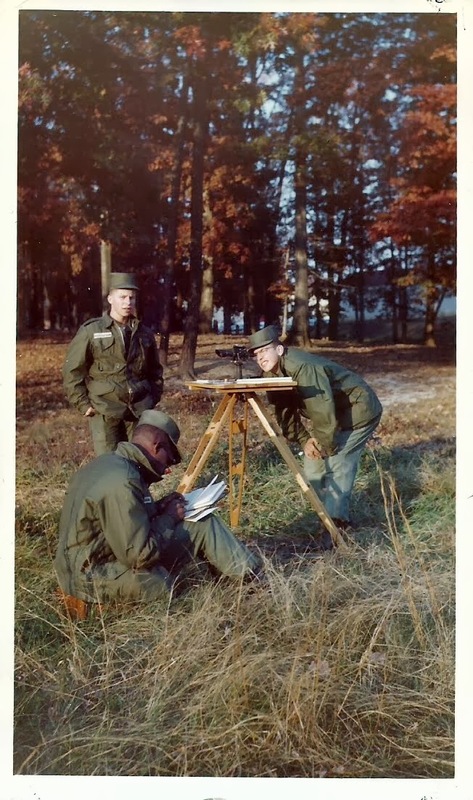 To accomplish these tasks each topographic company within the 649th was divided into three platoons – the Survey Platoon (topographic & geodetic survey), the Photomapping Platoon (photo control, compilation and drafting) and the Reproduction Platoon (layout, photolithography and press). So let’s take a look at these processes as practiced by Soldiers of the 649th. This isn’t intended to be a comprehensive overview of map making; there are some large gaps in this tale simply because I don’t have any photos depicting specific steps. The real goal here is to highlight the Soldiers and their activities. Each map starts with two things – stereo aerial photography and a topographic survey to ‘tie’ the photos to their location on the face of the earth. 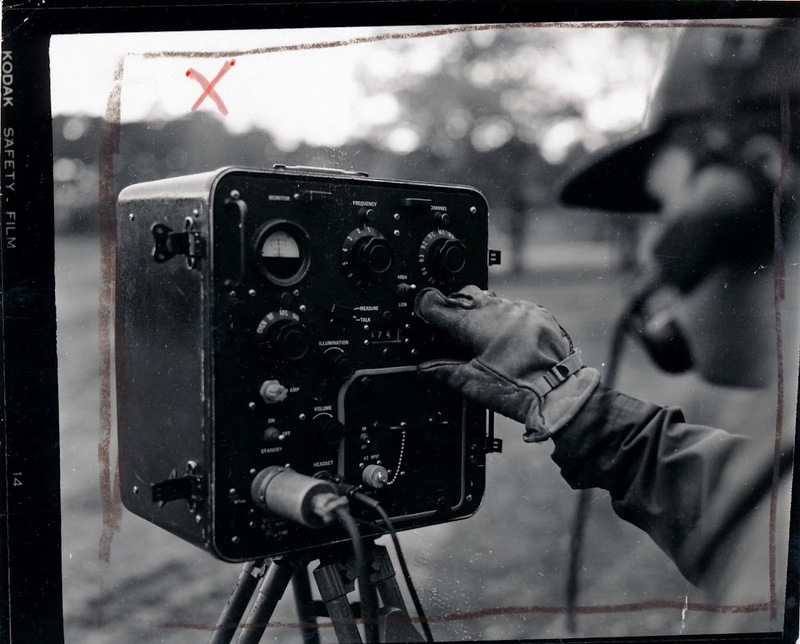 Army topographic units relied on US Air Force photomapping squadrons to provide the aerial photography. Once the topographic unit got the aerial photography in hand it was up to the surveyors to go out and collect precise location data for points visible in the photographs – things like road intersections, prominent terrain features or pre-positioned survey point targets. APPS – the Analytical Photogrammetric Positioning System. The APPS permitted surveyors and terrain analysts to precisely determine points on the ground using georeferenced stereo images. The system consisted of a point positioning stereoscope hooked to an early HP desktop computer. Each set of stereo images came with a computer tape that held the ephemeris data for each image. The operator would pick a point on the image in stereo (road intersection, building roof, etc. ), tap a foot switch and the computer would print out the point location in latitude and longitude. 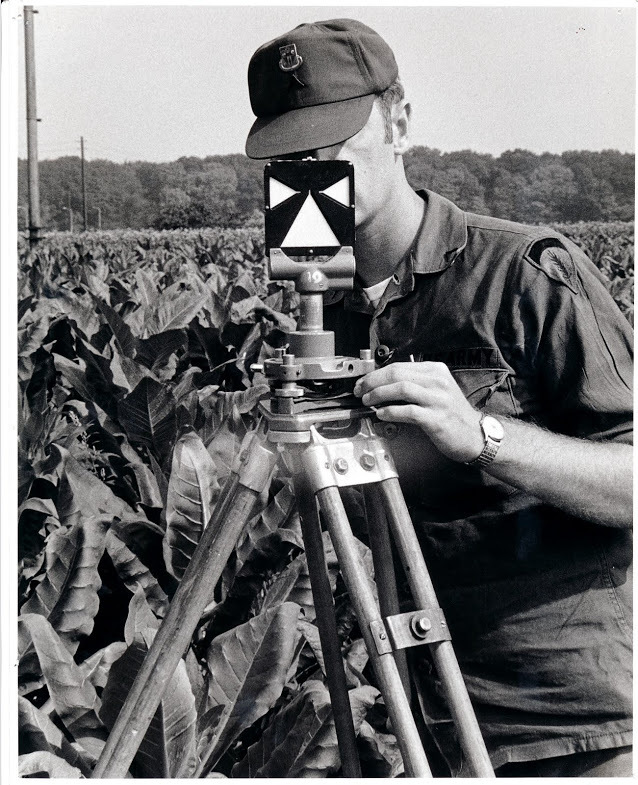 The APPS was often used by surveyors to collect photo control point coordinates without having to do a formal field survey. For its time this was a revolutionary system. Surveyors ‘turning angles’ with a conventional theodolite (probably a Wild T2). The instrument would be set up over a known control point and used to measure the precise angle to other control points. 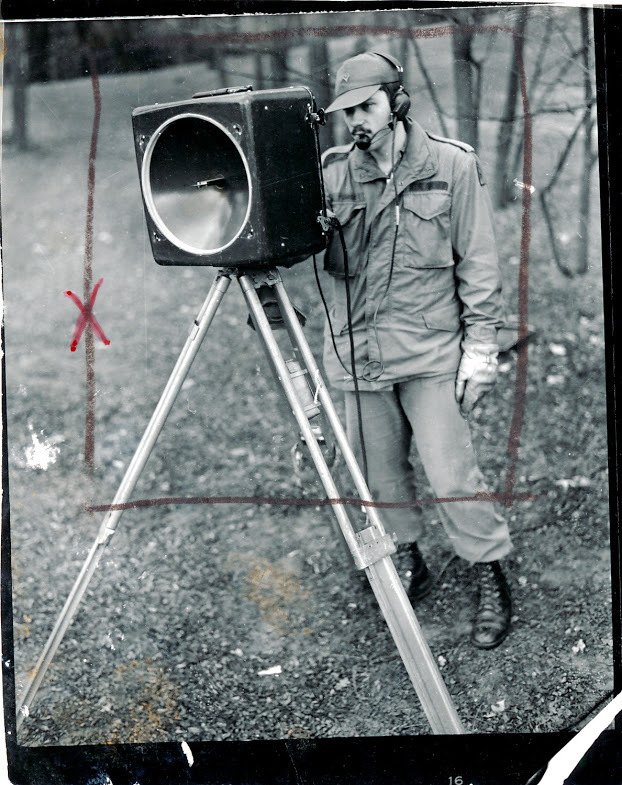 The operator would call out the angle readings and the Soldier standing behind with the notebook would record the readings and do quick checks of the angle measurements to ensure the readings were accurate. 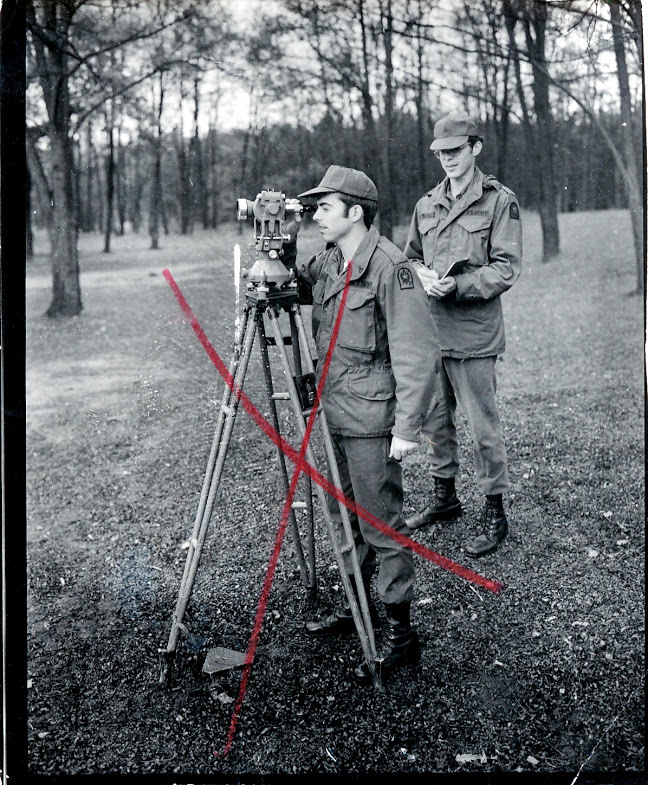 What are the surveyors in the previous photo aiming at? One of these, of course! This is a Wild survey target. It would get set up over a control point that is key to the survey. The theodolite operator adjusts the crosshairs in the theodolite telescope so they bisect the white ‘arms’ and ‘skirt’, of the target, then reads the angle of measurement. If a theodolite measures angles how do we measure distances? Well in the 1970’s we used microwave distance measuring equipment called the Tellurometer. The system consisted of a master and a remote unit and measured the time it takes a reflected microwave signal to return the master unit, which was then converted into distance. While I don’t have any hands-on experience using these units, I do remember sitting in on several meetings at the 649th where the surveyors discussed what a headache they were to operate and maintain. By 1980’s standards this was old technology and the units the Army had adopted were becoming maintenance nightmares. But in their time these distance measuring units were a revolutionary time saver. Note the headset the soldier is using. He’s actually talking to the operator at the remote unit via a built-in radio link. The two operators had to continuously coordinate settings and monitor performance during the distance measurement operation. Here is the back of the Tellurometer unit showing the instrument settings panel. This picture shows the only Soldier in this series that I’ve met. 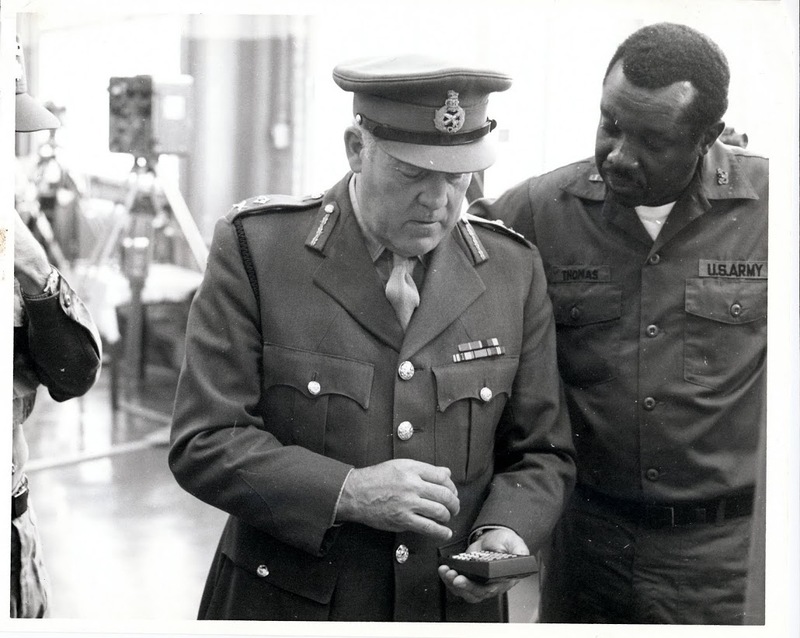 CW2 Thomas (on the right) is demonstrating a new Hewlett-Packard calculator to a visiting British Army officer. CW2 Thomas was one of several survey warrant officers assigned to the 649th. We met at Fort Bragg, North Carolina years after this photo was taken. The Hewlett-Packard (HP) calculator is interesting because they were widely adopted by surveyors due to their rugged construction and advanced functions that were well suited to surveying applications. While I don’t think any HP pocket calculator was ever officially adopted by the Army they were in wide use at the Defense Mapping School where our surveyors were trained. Many of the HP calculators found their way into survey units through local purchase by individual units. Photomapping is the process of compiling a topographic map based on information seen in the aerial photographs. Military topographic maps consisted of at least five distinct information layers, each with its own color – cultural features (black), water (blue), vegetation (green), contour lines (brown) and boundaries and built-up areas (red). It is the job of the cartographer to extract each of these information layers from the aerial photography to create a map manuscript. First the cartographers would rectify each aerial photo by removing any tip or tilt in the photo and tying it to the survey control points. Then they would use a device called a multiplex plotter to project the photos in 3D so the cartographer can trace out the key features while viewing the photos in stereo. Once the information is traced onto a manuscript sheet it is passed over to other cartographers who precisely trace out the collected information using the precise symbols we see on the finished map. 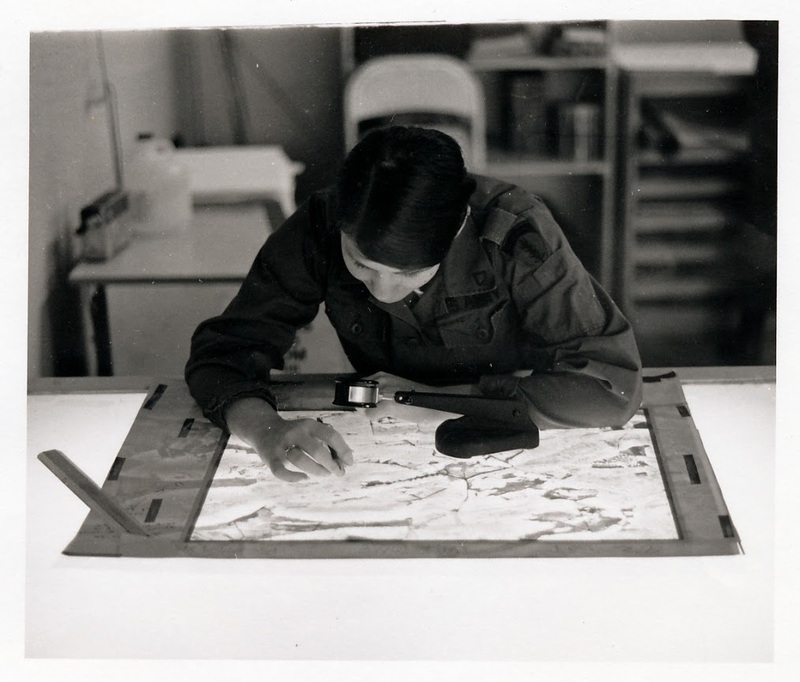 This photo shows a cartographer setting up a multiplex plotter in preparation for tracing out a new map information layer using photomapping techniques. The multiplex plotter used a stereo pair of aerial photos to project a 3-dimensional image of the terrain onto the white disc or platen of the mutiplex tracing ‘table’ (the device with the white disc seen sitting on the table). The tracing table has a small tracing dot engraved on it that sits directly above a pen holder. 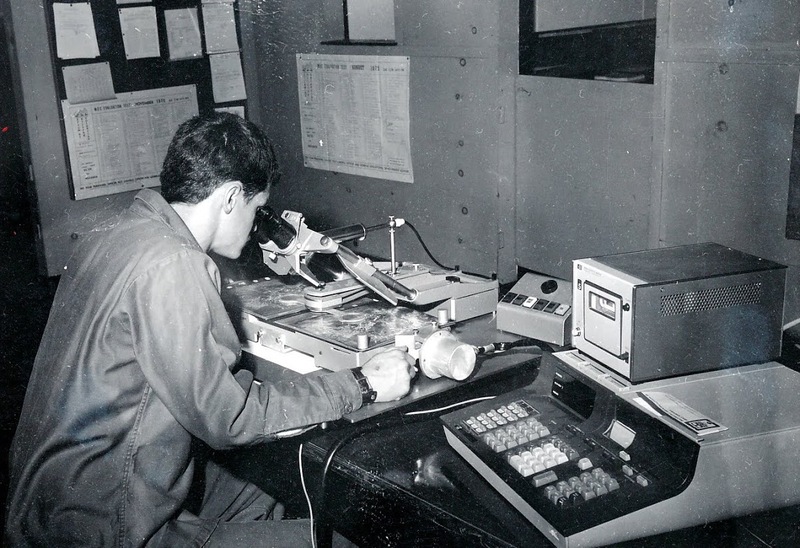 The stereo images have been transferred to two small glass diapositive images, and in this picture you see the cartographer holding one of the diapositives in his left hand as he mounts it into the projection stage. The tall ‘can’ in his right hand is the projector assembly that contains the projection lamp, lens assembly and filter. One diapositive is filtered red, the other blue, and the operator wears a pair of glasses with one red and one blue lens (just like the old-time 3D movie glasses), enabling him to see the projected image in stereo. 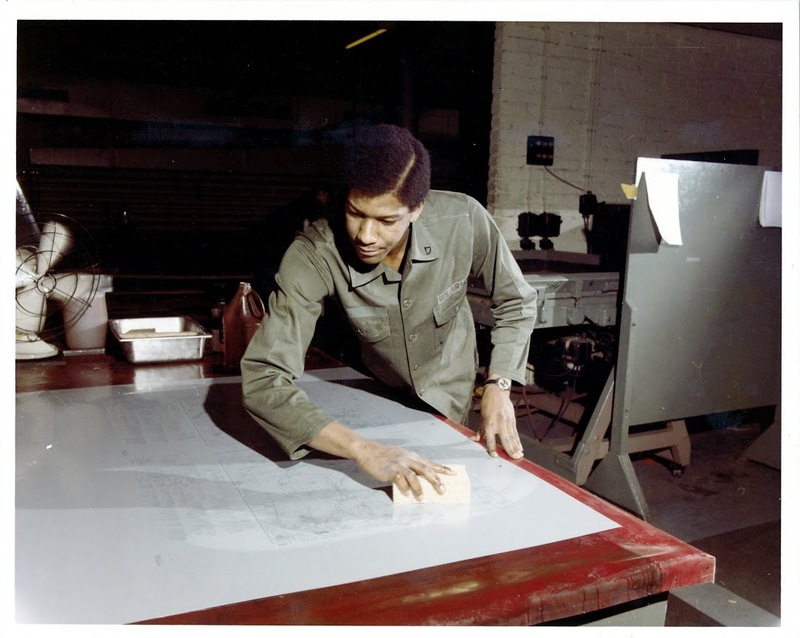 Here we see a cartographer tracing data from the projected image onto a manuscript sheet (usually a sheet of dimensionally stable material like Mylar). You can see entire image projected onto the the table surface just under his forearm, but only the small area projected onto the multiplex table platen is in focus. Engraved on the center of the platen is a small tracing ‘dot’, and mounted directly below it is a tracing pencil. The cartographer carefully adjusts the platen up or down so the tracing dot appears to rest directly on the ground on the stereo image and he then begins to trace out features. He traces one layer type onto each sheet; one sheet for cultural features, one sheet for hydrology (water), one sheet for vegetation etc. Once a manuscript map layer is drawn it is turned over to other cartographers who carefully trace out the data using approved map symbols and line types. This is called the compilation process, where the cartographers compile the data into standard formats. Map compilation is precise and exacting work, and a cartographer can spend days, sometimes weeks, working on a single sheet. Once each manuscript layer is complete it the information it holds is photographically ‘burned’ or transferred to specially coated plastic called either scribe coat or peel coat (seen above). 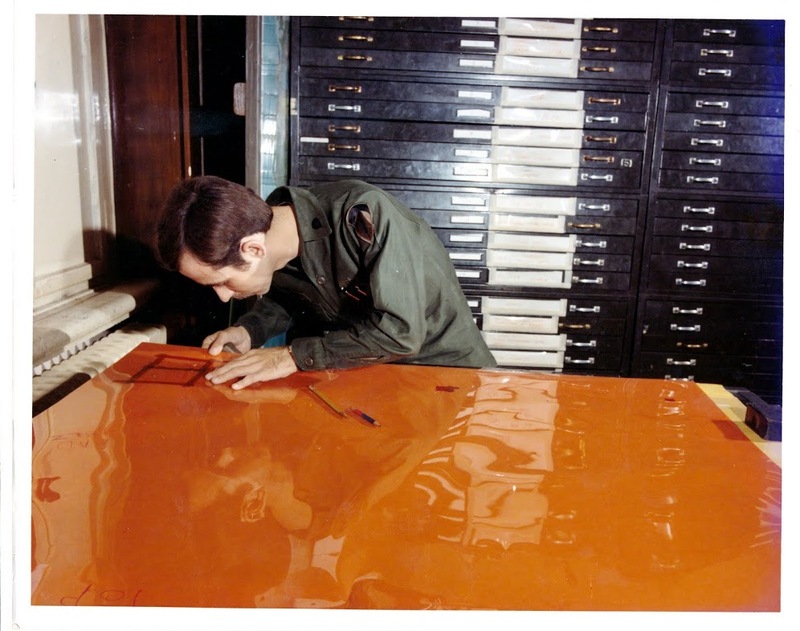 The words ‘scribe’ and ‘peel’ describe the manner in which the orange coating (seen above) is removed to create clear windows through which a photographic negative can be exposed. Because of the unique nature of the orange coating it completely blocks all the light wavelengths that a film negative is sensitive to, so the orange areas come out black (or unexposed) when the negative is processed. Cartographers use specially designed scribing tools to carefully etch away the areas that represent point or linear features like individual buildings or roads. For larger areas like lakes or farm fields a sheet of peel coat is used, which allows large areas to be carefully cut with a sharp knife or razor blade and peeled away. All military maps have grids, and the grid on each map is unique based on the area of the world it covers. Calculating and drawing these grids requires great precision and accuracy since the grids must be exact or the grid coordinates a Soldier derives from an improperly gridded map could be hundreds or thousands of meters off. 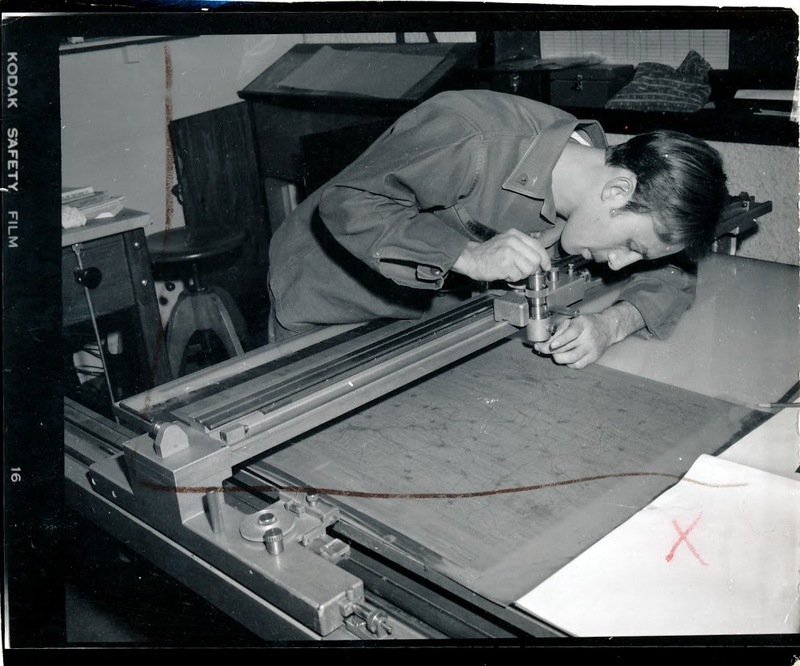 Here a cartographer is setting up an automated plotting device used to precisely draw the grid for a particular map sheet. Automated tools like this greatly reduced the human error often encountered when drawing grids and speeded up map compilation. Once the cartographers completed the map compilation phase the manuscript sheets were turned over to the Reproduction Platoon for all the steps necessary to print the final map. This normally involved preparing negatives from the scribe and peel coat layers prepared by the Photomapping Platoon, editing and correcting the negatives, making press plates and finally, printing the map. To speed up the map compilation process cartographers made heavy use of pre-printed text. Things like standard place names (cities, towns, etc. ), major feature names (rivers, mountains, etc.) and road identification symbols (highways, autobahns, etc.) would all be identified using standarized text that was prepared by the Reproduction Platoon. 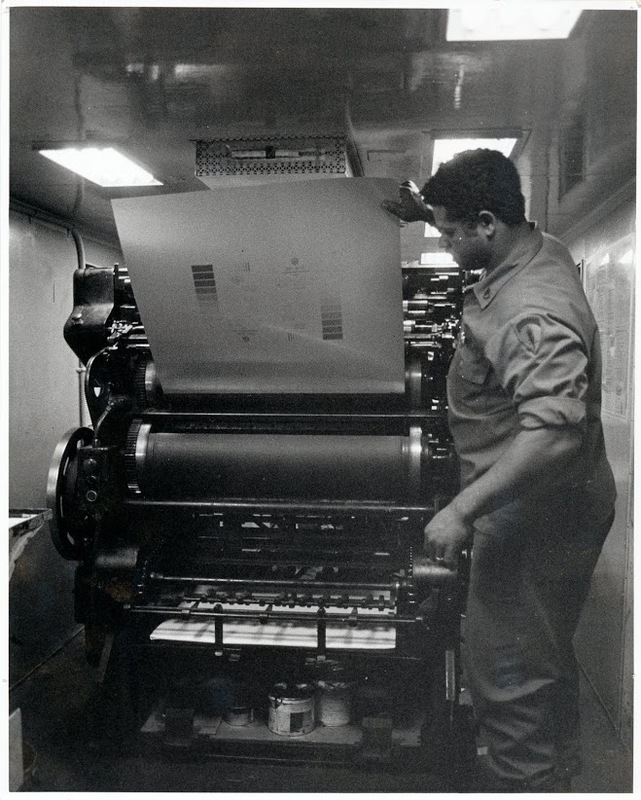 The cartographer would submit a list of feature names with text style and size requirements and the Reproduction Platoon personnel would provide the information on clear adhesive backed sheets that were created using a photo transfer process. Here we see a Soldier setting up some text as requested on the order sheet attached to the clipboard. One of the last steps in map production is making the negatives from which the press plates are produced. Here we see a Soldier from the Reproduction Platoon doing a final check of a negative before approving it for plate production. The final step before going to press is the plate making or ‘burning’. Press plates are just thin sheets of aluminum specifically sized to fit on a printing press. A map layer negative representing all features of the same color (black, blue, green, brown or red) is placed on top of a press plate that has been coated with a photo sensitive emulsion and the two are placed in a vacuum frame plate maker that uses a high intensity lamp to ‘burn’ or expose the positive image onto the plate. Once the plate is burned it is washed to remove the emulsion and the resulting image is what gets printed on the map. In this photo we see a Soldier from the Reproduction Platoon doing a final cleaning of a press plate before sending it on to the press section. 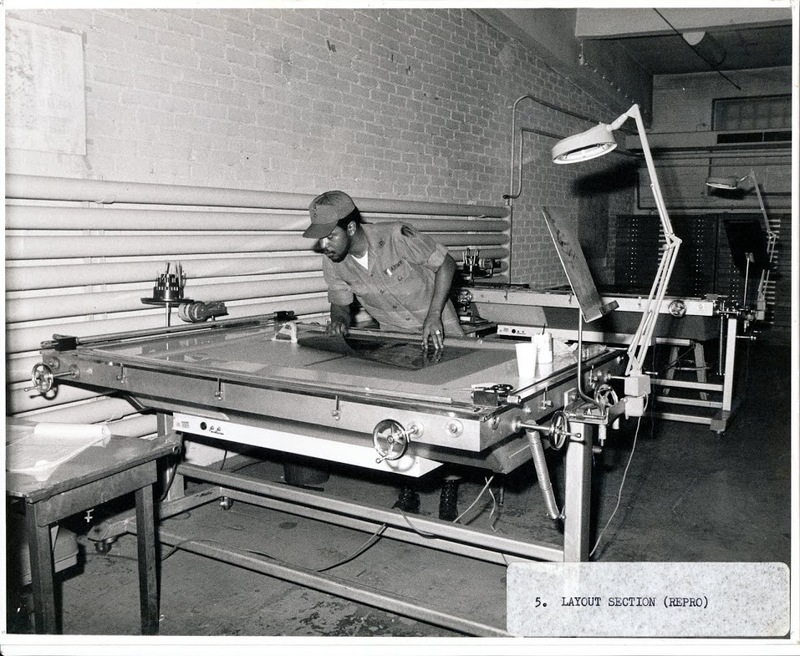 The 649th ran a number of presses of different size and capacity, everything from small trailer mounted presses capable of producing only 1:50,000 and 1:250,000 scale maps to large format presses permanently installed in the battalion’s base plant and capable of producing over-sized maps and other geographic products. 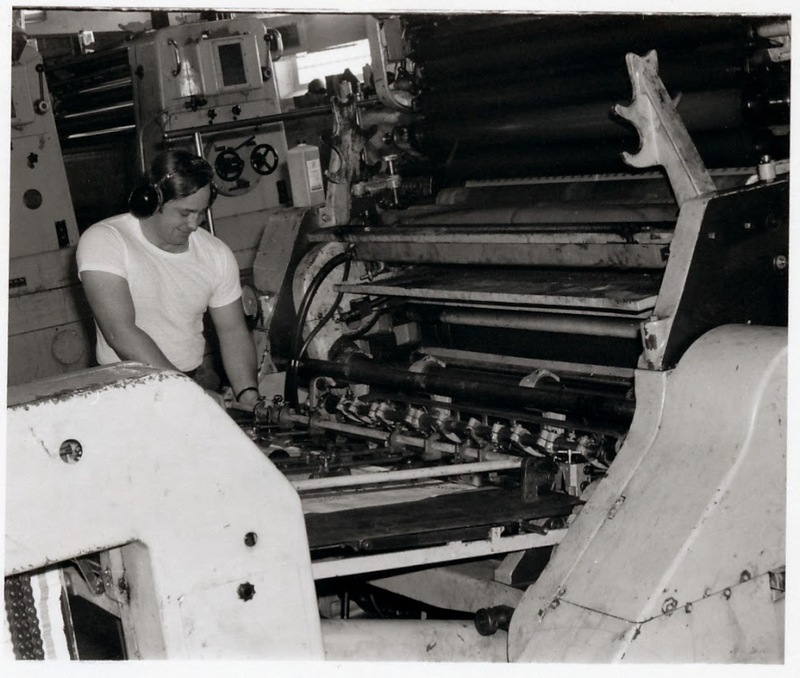 In this picture we see a press operator from the Reproduction Platoon loading a press plate onto a van mounted Harris offset press. Here’s a photo of one of the 649th’s presses installed in its baseplant at Tompkins Barracks in Schwetzingen. Here’s a photo of the feeder end of another one of the 649th’s large format presses. 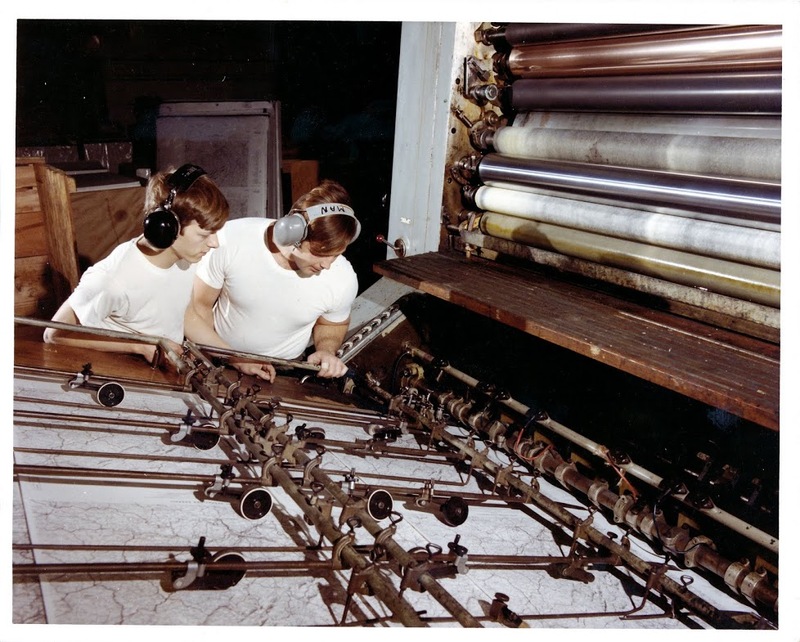 In this photo it looks like already printed map sheets are being fed back through the press to add another information layer or military overprint. The very last step in map production is actually map distribution. The 649th also had a Map Distribution Platoon that stocked and distributed the printed maps to units all across Europe. The platoon was responsible for getting the most current maps into the hands of the front line soldier as quickly as possible. 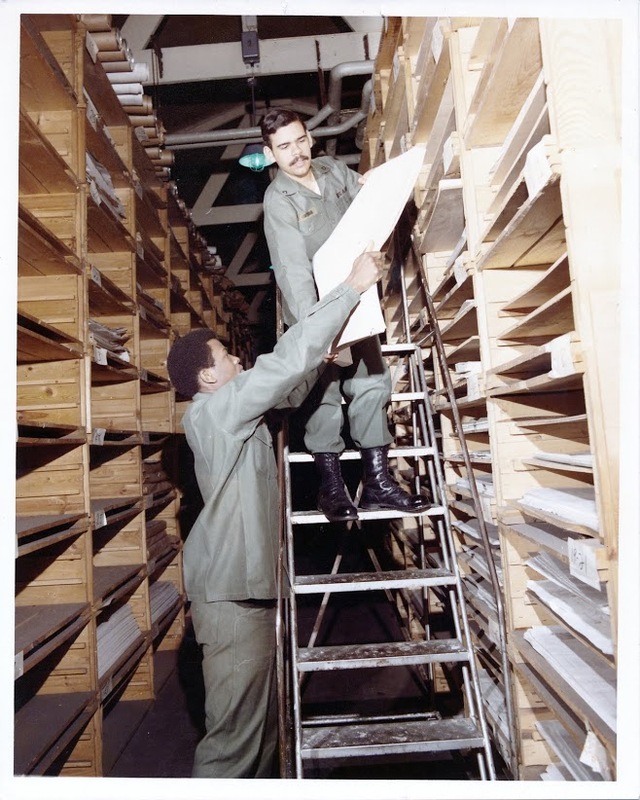 The 649th maintained a map distribution warehouse at Tompkins Barracks and at several contingency sites around Europe. The platoon even had specially designed vans that were mobile distribution warehouses that could service forward deployed headquarters. Here we see Soldiers from the Map Distribution Platoon restocking maps at the distribution warehouse at Tompkins Barracks. 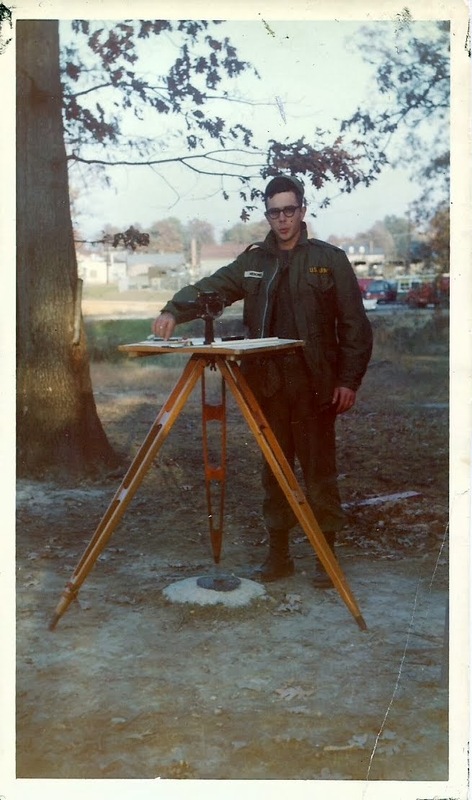 And there you have it, Army field map production circa 1970. As I mentioned in the start of this post I’ve taken a lot of liberties by overly simplifying the map making process with the intent of highlighting the Soldiers and activities of the 649th. If any readers recognize any of the Soldiers shown in these photos (or if you happen to be one of these Soldiers) I’d love to hear from you. You can either add a comment to this post or contact me at oldtopographer(at)gmail.com. If I’ve made any factual errors in the map making process, or if I’ve mis-identified any of the process shown in these photos please leave a comment here and I’ll make the necessary corrections. Thanks, and I hope you’ve enjoyed this trip down memory lane! Owens remembers a telephone call he got from an attorney representing the victim of a traffic accident along the state border. Yessir, a very good day! Did Robert E. Lee Spend Saturday Night in Toledo, Ohio? And people who live there are not seen again! To spend their big night all alone! The song is by Randy Sparks, written after a particularly uninspiring night in Toledo. John Denver started performing it in the early 1970s and was ‘uninvited’ to do a concert by Toledo Mayor Harry Kessler. Denver and Toledo eventually kissed and made up, but there’s no denying that Toledo wasn’t, and still isn’t, an entertainment mecca. Everybody’s heard of the great Toledo War, right? In 1835 the State of Ohio and the Territory of Michigan went to war over a six mile strip of land that extended from Toledo west to the Indiana border. The war arose from a boundary dispute which was triggered by an inaccurate boundary description set out in the Northwest Ordnance of 1787 and an inaccurate description of Ohio’s northern boundary set out in the Enabling Act of 1802 (yet another Congressional screw-up). Both Ohio and Michigan considered this strip of land, known as the Toledo Strip, to be theirs. You may well ask (hell, you should ask) why all the interest in Toledo? Well, in the early 1800s Toledo was poised to become a major shipping center on the Great Lakes. The Erie Canal had just been opened, triggering a trade and settlement boom in the upper Midwest. Politicians emboldened by the success of the Erie Canal were talking seriously of financing a canal following the Maumee River from Toledo to Fort Wayne, Indiana, and from there on to the Mississippi River. If this plan came through then bulk goods could move cheaply by water between New York and the Mississippi. Toledo would become one of the major trading hubs in North America. Governors and legislatures drooled over the prospect. Suddenly Toledo was worth fighting for! The Toledo War was really nothing more than a bunch of alcohol-fueled hotheads on both sides throwing insults and the occasional lead ball across the border. Still, the federal government had to do something to settle the dispute. After long negotiations and intervention by President Andrew Jackson (and a little arm twisting to get Michigan to play along), the border issue was ‘settled’. All that remained was for a formal boundary survey to be conducted and the results agreed to by both Ohio and Michigan. In 1835 (Washington) Hood was associated with Robert E. Lee in a map-making expedition to settle once and for all the Ohio-Michigan boundary dispute. This involved a strip of land averaging six and one half miles in width and extending along the northern border of Ohio west of Lake Erie. Michigan’s claim was based on the boundary laid down by the Northwest Ordinance (1787). Ohio’s claim was based on the line set forth in its state constitution, which the U.S. Congress had neither confirmed nor rejected when Ohio was admitted to the Union. Which begs the question, just what do a trio of wild and crazy 19th century West Point grads do for entertainment while in Toledo? Grab a bite to eat and listen to some jazz music perhaps? and home of the Cake Walking Jazz Band. Although Michigan lost this round they were given what is today their Upper Peninsula as compensation. At the time it seemed like an unfair trade and there was a lot of grousing about it among Michiganders (or Michiganians, or whatever they call themselves). Today’s Michiganders think it was one heck of a good deal. 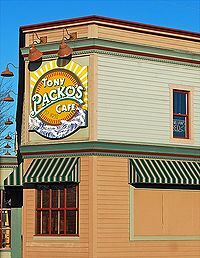 All you have to do is drive through downtown Toledo to understand why. And the Toledo – Mississippi River canal project? It petered out. One word. Railroads.